Agape of Central Alabama is proud to announce our 2nd Connecting Hearts Event in the Birmingham Area. The Connecting Hearts event will take place on Tuesday, April 23th, 2019 at the Noah's Event Venue in Hoover. A reception will begin at 5:30 p.m. and the main event starts at 6:30 p.m. All ticket holders participate in the reception. V.I.P. ticket holders will have the opportunity to meet and greet with the speaker. Agape of Central Alabama seeks to provide help and hope to vulnerable children and their families. Our goal is that every child find belonging in a safe, nurturing family. This event raises funds and friends to help Agape of Central Alabama meet the needs of hurting children. We are pleased to announce our special guest for the event will be Christian singer Ginny Owens. Ginny has been able to see the more profound truths of life, partly because she has been blind since the age of 3. Her music has won her many awards, but her story has touched countless hearts. Her desire for her audience to see God's goodness in the midst of trials has transcended her music, as she also writes and speaks. Ginny became a household name as the Gospel Music Association’s 2000 New Artist of the Year. Growing in notoriety as both a singer and a songwriter, winning 3 Dove awards and multiple ASCAP Awards along the way, Owens has sold over a million records over the course of her career. A top performer on the Christian radio charts with hits like “If You Want Me To,” “Free," and “I Wanna Be Moved” among others, Owens has released no less than 11 full albums and 3 EPs, and her music has also impacted mainstream audiences at Lilith Fair, the Sundance Film Festival, and the White House. Come join us as we Connect Hearts to impact the lives of vulnerable children. 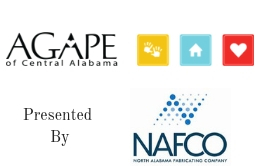 Each share, tweet, and email helps us spread the word about Agape of Central Alabama.